Many companies have matching gift programs where the company will match an employee’s contribution to a 501(c)(3) corporation. A non-profit educational charity, AEF is a 501(c)(3) corporation and is therefore eligible for matching gifts from companies that have such a program. 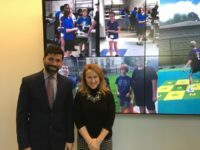 Description of Charity: The Foundation funds system-wide initiatives and creative new projects to enhance the educational experiences of Arlington’s teachers and students. If your company asks for additional more information for matching gifts, please contact us.